Listuguj students had the opportunity to explore future plans on Feb. 24. The LMDC organized a career fair, and invited a mix of professionals to represent their fields. The hope was to create an event that was engaging. NBCC had two simulators with joysticks set up. Students got to try their hand at running excavators. A survey beforehand helped the organizers gage interests. They invited guests, and planned presentations accordingly. The second half of the visits were intended to directly address the students interests. Panelist spoke about Education and Business in one classroom, and Health and Law in another. Other popular fields identified in the survey were graphic and video game design. Davinci College was present to explain some of their programs. Fashion, and design were also identified as big interests. Whitney Dedam, from Listuguj, had a table. 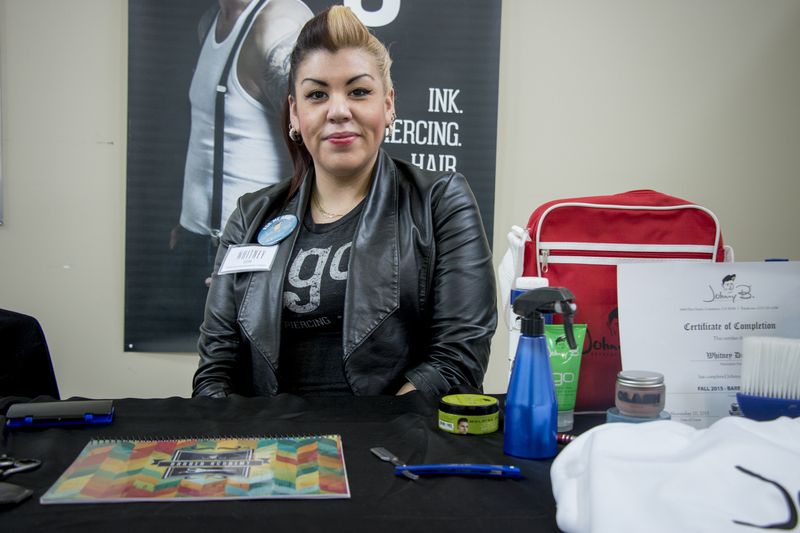 She works as a hair stylist in Moncton, and is now the only educator with Johnny B Hair Care in Canada. The training took her to Los Angeles. And aside from trying to help students learn a bit more about careers they may be interested in, the organizers of the career fair also wanted to provide the opportunity to learn about other careers that may be in demand. Representatives from the MMS offered information on careers needed for the Mesgi’g Ugju’s’n Wind Farm. As much as the fair was for kids to learn more about what they were already interested in, it was also to help expose them to the many careers out there. Especially for those who don’t know what they want to do yet. 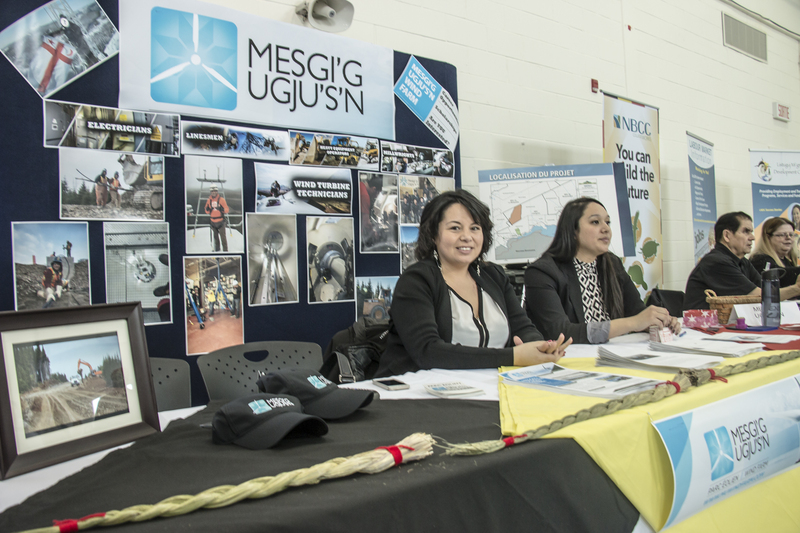 Terri Lynn Morrison and Natalia Caplin at the LMDC Career Fair speaking about the WindFarm. “When we first started working on the wind Farm, we were focused on the construction side of it. So now that we’re going to be in commercial operation December 1st, we’re now looking at the operations, the long-term opportunities for the next 20 years, and that’s why right now we’re dong a big push to have people go out to get certified as wind turbine servicetechnicians,” Terri Lynn Morrison. Two students are in Maine right, and will have completed their program in June. They already have conditional offers of employment. But Morrison said there is room for at least two more, and potentially more than that. Whiteny Dedam at the LMDC Career Fair on Feb. 24. “Learn the rules like a pro, so you can break them like an artist,” is one of Whitney Dedam’s favorite quotes. “Once you know the basics, hey, it’s your own world,” she said. Dedam moved to Moncton to become a hair stylist. She is now the manager of the barber area of her shop, and is the only official brand ambassador for Johnny B hair care. She even taught a her first class in February, at the same school she graduated from. Dedam struggled, and says she still “lives like a student” sometimes, but she loves what she does, and believes there’s opportunities for anyone who wants it.